If you have something you would like posted, please email your request by clicking here with your mouse. Please include "ALR" in the subject title. Veterans, looking for some place to vacation here in the great state of Minnesota. Check out Veterans on the Lake Resort in Ely MN or the DVRC Campground on Big Marine Lake just 30 minutes from downtown St Paul or 10 minutes north of Stillwater. Click on our link to Veterans Interest below. Got something to sell or share with us? ..we'll list it here with a picture if you like!! This is our Post 172 ALR pin. It cost $5. The pin also serves as the base for participation recognition attachments. 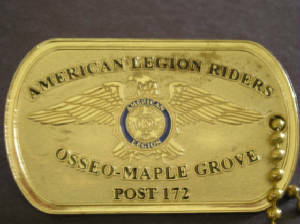 You can pick your pin up at the next ALR monthly meeting.